The following was transcripted from a journal that my grandma Isabella had written. It includes (to the best of her memory) the stories of her parents and grandparents lives in Sweden, their immigration, and other thoughts. It is not in chronological order. Notes added by myself are in italics and are only for accuracy. The information here, although not completely correct, was invaluable to my research. "Klöver Knickt- Axel Swanson's cousin. Kalle Plig Skanberg- Ted's uncle, his brother (Kalle),Berger and he went west. Johann Sevander Solomonson born June 25, 1883. Started school at 8 years old, not enough clothes before. Mor (Johanna) worked doing hard farm work, raking and putting in hay and threshing grain with a home made tool. Paid 33 öre a day. Her children were away and working in farms in the winter. Her first husband was a widower with 3 children, C.A, Huldah, and Hannah. He had a one man farm. When he died she moved in with her sister Christina with Josephine, Minnie, Jennie, Alfred, and Anna Sophia, all under 10 years old. Later, they moved to their own little stuga (cottage). 1851- She was born Johanna Svenson in Knäred forsamling in Halland. Her father was a bonde (farmer) with a nice farm. 1868 and before was a very hard year in Sweden. Even potatoes were scarce. Mor and her older sister Christina (b. 1848) had to leave home in Branhult (Brånalt) to do farm work. Though her father had a nice farm, he died a very poor man. She married the widower in 1872. Mor had her sister Petronella (Nellie) work for her as a piga (maid). Her younger sister was named Louisa. She had 2 or 3 brothers who immigrated to Wisconsin. In 1890, Mor and her children moved to her own house which friends helped them build. Mor bought a house several hundred years old. They tore it down and moved the timber 3 miles to a piece of land ( 2 tun land) which she leased for 99 years from Petrus Jonasson called (Petrus i Upsalla) (Upsala). 1 tun= 480 sq. ft. 6 ft. = 1 famm. The lumber was all pitch, logs were huge and square. They had 2 rooms and a kitchen. Open fire place with an oven that held 20 loaves of bread. Teachers in Swedish schools were paid $200 a year. 800 Kroner. In summer, farmers worked from 3 am to 11 pm. 2 hours off at noon. How sad it was for Mor to say goodbye to her son and daughter and 2 grandchildren. She had only Helen left with her in Sweden. Axel had sent the money for the trip, $45 each. Mor and Helen came in 1902. Helen was 14. They arrived at 2 am. They went to Moster Nellie's where Axel and his cousin Klöver Knickt boarded. They staid (sic) over night and then when (sic) to the house Axel rented. In 1893 my mother had left Sweden for DuBois. C.A. Johnson had sent her transportation money. By this time C.A. her half brother had married Nelly her mother's sister. She staid (sic) with them a while and then got a job. She met papa and they were married in 1896. She kept boarders. Papa came to DuBois in 1887. He was born June 7, 1868. In those days you had to bring alot of food for crossing the North Sea. Uncle Al worked at the tannery .12 1/2 hr. Born in Hinneryd forsamling about 3 or 4 miles from Mother but they did not know each other. He left Sweden in 1888. "Jag var född den hårda året" (I was born in the hard year.) he said. 1868 June 7. He had 2 (actually 3) brothers and 1 sister his mother and sister died in Sweden, his father in Norway. 1 brother married and lived in Norway. 1 brother married and lived in Germany. Mor's father was Sven Svensson (I found him to be named Sven Jacobsson). She had 3 (actually 5) sisters and 3 (actually 4) brothers. Mor's father locked up the bread and potatoes so it could be doled out carefully. Though they lived on a farm, the crops were mediocre for many years and there was much suffering. As a young girl Johanna went to Småland and hired out to a farmer. So did Christina. All they got was their food. Johanna met Johan in Upsala (Uppsala) who needed some one to help his wife but mainly to do farm work. His wife died and she married Johan when she was in her early 20's. Johan had the biggest farm in Upsala but he was too generous (He got his farm thru his first marriage). She was the boss. He died poor and everything had to be sold even the furniture to pay mortgages. He was cheated right along. Johanna was too young and inexperienced to prevent it. His first 3 children were grown when he died. Mors sister Nelly worked as a piga (maid) for Mor. In time one of the brothers in Wisconsin sent Nelly a ticket for USA. In USA young women earned $2.50 per week. Men at the tannery 12 cents and then .15 an hr. Papa earned 17 1/2 an hr running machine. Mors mother died early. Her father remarried. Mor was fond of her stepmother. There were no children of this second marriage. Mor's father was a bonde (farmer). One of her brothers set out for America and was murdered before he got to Gothenburg. As he was going on a long journey he had money on him and it was stolen. There were 2 forests in Sweden which were known to be dangerous. Tivägen and Kålmorden. (Tiveden and Kolmården) Felons hid behind trees and rocks. After the 30 years war, Denmark tried to take the Southern provinces of Sweden including Skåne, Blekinge, Halland, and Bohustän (Bohus län). Karl XI who was a young had a general Magnus Stenbok. Thru a disguise and a ruse (selling peas or ärtar ((ärtor)) to the Danish Army so he could spy on them. The Danes complained on the peas. He said "I'll be back with better ones". He did but with a trained army. and ammunition. A woman named Blanda helped too. She got all the pretty girls together, invited the Danish officers to the kalas (party) and got them drunk and that is the way the Swedes chased the Danes out of home territory in 1545-1560. Friss Anders was a peddler selling combs, needles, etc. He had a short fuse and was always mad at someone. Others who became angry fast were called Friss Anders. He sold all kinds of notions. At Christmastime, he sold pictures of the King and Queen and tompte (tomte are gnomes, this probably refers to small wooden figures). He could also pierce a lady's ears. To keep the hole open he put a hair from a horse's mane to keep it open. The village smithy also performed this service. Another pedlar (sic) Sten Backen was returning home. He had a few drinks and he fell in the creek. He thought he was drowning. Orally he confessed his sins to the amusement of some boys near by. His worst sin he confessed was illegally selling Danish playing cards in Sweden. They didn't have a tax on them. Christina married Nels Peter (Samuelsson) and bore him 2 children. He went to America but she never followed. He wrote to her but he education was so poor she could not answer it herself but Mor wrote for her. Later Nels Peter was killed in a steel plant in US. Sevander was born in Christina's home. Later Mor rented a little house and paid for it by giving a few days work. In 1884 Mor got her own house, 3 years before, her rented house caught fire from the back oven. She had baked 20 loaves of bread. Mor grabbed the baby and Minnie (grabbed) her pretty clothes. Mother was a piga (maid) for the farmer who was the owner of the farm which her father (Johannes i Upsala) had owned, where she was born. Uncle Al was a dräng (farmhand) in Halland. He was in practical servitude or slavery for a whole year. His master was cruel and also stingy with the food. For a few days after the fire Mor, Minnie, Jennie, Anna Sophia (who died on her 19th birthday Born Feb 9, 1881) Sev and Helen lived with the Fredlund family then to Aunt Christina's again for about a year. Her husband had died in the US. Mor rented a little house until hers was built. She bought an old timber house. The timbers were 12 inches thick. She asked some friendly farmers to help her. They hauled the timher to land she leased for 9 yrs. Some carpenters cut the timbers to 8" thick. The walls were 8" thick. The plaster in between was marsh. There was no clay in Småland. No nails were used the timbers were knotted in. Boards were used inside and then papered. The ceiling was boards. The outside as boarded too. They were then painted white and the corners were painted white. The roof was of halm (rye straw) It took an expert to lay the roof so it would be waterproof. They moved in- in the fall of 1894. Gubben Bengston thought he was a big shot because he was one of the first settlers in DuBois. John Charles was another of DuBois aristocrats. John Johnson was third. They helped C.A. (Johnson) come to US. Mother worked for J.E. DuBois. Aunt Jennie worked for Mrs. Watts. Aunt Jennie couldn't understand or talk English so she had to go next door and ask mother to translate for her at first. Mother went back to Sweden with Rachel and Harry. She missed her mother. Papa was going to stay a year longer and earn money. Mother wrote she didn't like it there and wanted to come back to America, she'd do anything. He sent money so Sev could also come with her. Later he sent money for Helen and Mor to come. Sev. 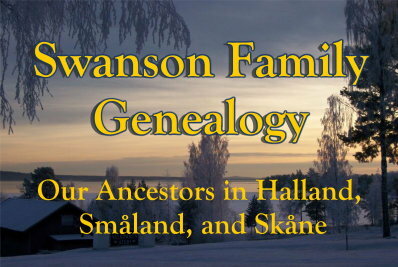 's grandfather was a professional soldier in Sweden, of a Swedish mother and a French soldier father named Jean. He fought in the Crimean war and fathered a son in Rome. These years soldiers just moved on. Sev does not know exactly where his own father was born. probably in Italy. Sev's father's first name was Solomon. Solomon never met his father. Solomon too as a very young man fought in the Crimean war. Major Jean fought later on in the Franco-Prussian war where he was killed at the Battle of Sedan (along the border). This was a big battle (Germany became unified after this war). Solomon was just a comon (sic) soldier but Jean was a major. "Leave the country. I'll stay here and fall under the murderer's axe" hearing these words from his father Jeans father and wife fled from France to Sweden during the French Revolution. Later he returned to France and fought in Napoleon's War. His son had been born in Sweden. This son fought in the Finnish-Russian War around 1809 in Sweden. Sev's grandfather therefore was half Swedish and half French. He was the first to have Swedish blood in him. The name Sevander is from the French line but it was spelled differently. Mor did not know how to spell it. Some how Solomon learned that his father had been killed in the Franco-Prussian War. He tried to find his father's body but he couldn't. They were in the same battle. Solomon heard that Big Major was killed. Quite old then too. After that Solomom returned to Sweden where he met Johanna (Mor) He was a professional soldier and that was all she knew about him. He just took off. Wrote to Johanna that he was joining the French Foreign Legion. Fighting was going on in Africa. Johanna never heard from Solomon again. She believed he was killed in Africa in all the fighting.